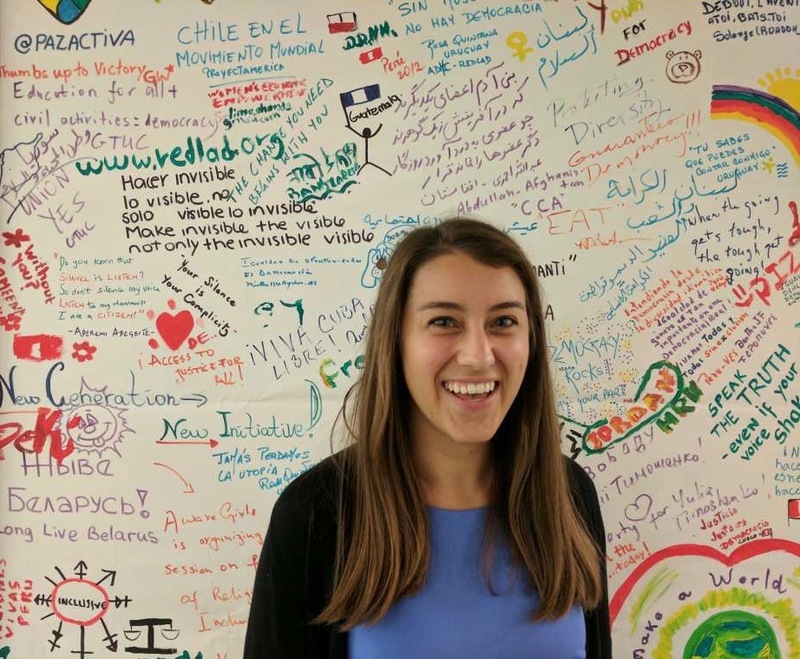 As part of a new partnership between the School of Global and International Studies and the National Endowment for Democracy, two SGIS students spent this summer working at NED in Washington, D.C. Kate Adams and Andrea Vega Yudico were the first to take advantage of the SGIS-NED internship, announced late last year. SGIS kicked off the NED partnership last December with an event at the U.S. Capitol. Along with the internships, SGIS and NED established the Mark Helmke Postdoctoral Scholarship in Global Media, Development and Democracy. Adams and Yudico write below about their experiences. It was only day three of my internship, and I was standing in a small, crowded room in the basement of the Capitol, watching the Speaker of the House and the House Minority Leader finally agree on something: the imperative of American support for democracy and human rights around the world. They were speaking at a ceremony honoring the five recipients of the National Endowment for Democracy’s 2017 Democracy Awards, all of whom have risked their lives to fight corruption and promote government accountability in their home countries. 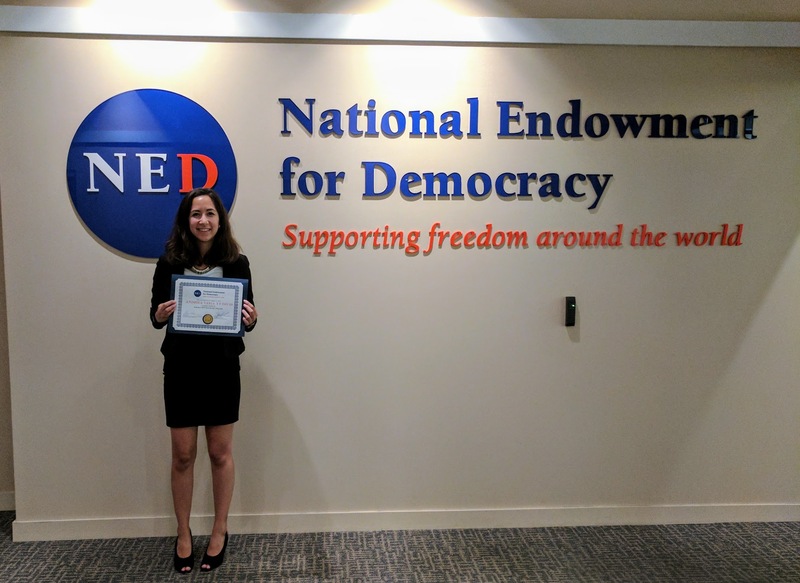 I spent this past summer interning at the National Endowment for Democracy in Washington, D.C. NED is a nonprofit, independent foundation that supports grassroots efforts to strengthen and grow democracy around the world. I worked specifically with the Reagan-Fascell Democracy Program, which hosts democracy scholars, activists, and journalists from around the world for five-month research fellowships in D.C. The Spring 2017 Fellows came from four different continents and worked in fields ranging from journalism, academia, the law, and civil society. Getting to know individuals whose careers have so tangibly benefited democracy in their home countries was inspirational in more ways than I can adequately describe. My internship responsibilities included assisting with the fellows’ events and presentations, creating a photo archive that functioned as a repository of the program’s historical records, and supporting program publications and promotional efforts. Participating in events hosted by NED’s International Forum for Democratic Studies taught me a lot about democracy efforts around the world, and sparked my interest in regions to which I had rarely even devoted a spare thought before. Interning at NED really complemented my coursework at SGIS. I was exposed to topics that I don’t have room in my schedule to study, and learned about the diversity of career paths an International Studies or area studies major can jump-start. I saw firsthand how the knowledge we acquire in our undergraduate education can be applied to produce real-world impact in a professional setting. Above all, my time at NED reinforced my conviction of the fundamental value of democracy, and brought concrete meaning to a concept which often seems abstract. At its heart, democracy is simply a form of government that validates and respects the dignity of its individual citizens, a truly universal cause. 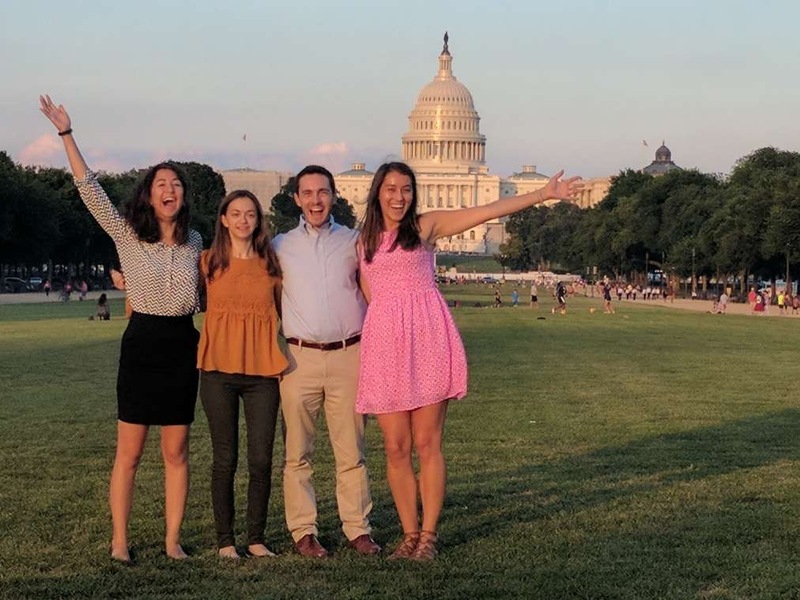 For the past seven weeks I spent my summer in Washington D.C. interning for the Center for International Media Assistance (CIMA), an initiative of the National Endowment for Democracy (NED). CIMA works to advance the development of independent media around the world to strengthen democracy. Through reports, events and catalyst activities, CIMA enforces the idea that a free and independent media play an indispensable role in developing sustainable democracies around the world. As an International Studies and Journalism major, I thought that CIMA’s efforts bridged together the interests from both my majors.Working at NED was phenomenal. My main tasks consisted managing content for CIMA’s newsletters and social media. I attended meetings on media development topics and assisted with administrative work. But a large part of my time at CIMA was spent reading about China’s influence on African media. At first, I wanted to write a blog post on how Chinese-owned media are promoting a type of journalism that influences news coverage in African countries with the intention to reshape perceptions of the China-Africa relationship. I spoke to current fellows at NED and other employees that were familiar with the topic. I settled on a post about the Chinese telecommunications investments and the implications it could have on Africa’s media ecosystem—specifically the cyber security impacts on the user level. I’ve grown familiar on infrastructure investments and soft power the Chinese implement in countries like Kenya and Uganda. After interning for publications in both China and Uganda, I had a personal connection to the topic that kept me interested. As an intern, you’re treated and respected like any other professional on your team. My supervisors trusted me in translating important announcements and researching media development topics. For instance, I was asked to do preliminary research on trust in the media in Japan and other parts of East Asia. Tasks like these directly fit into my academic goals, because it helped me explore possible options for topics to research during my semester abroad for my major. I truly felt that I was applying my academic studies with this professional internship. I also felt that with every task I completed, I was growing more confident in my future academic and professional plans. This internship taught and exposed me to issues that I don’t think I would have ever have thought to learn in a classroom setting. The topics I’ve researched and learned about have sparked an interest and passion for media development. As an intern, I covered the surface of media development issues, but hopefully with classes and other professional experiences, I can expand my knowledge on media development and bridge the importance for democracy and independent media.